Welcome to the Hawai’i Volcanoes National Park Page. This site is dedicated to providing useful information on Hawai’i Volcanoes National Park. Learn about the park’s history and wildlife, discover scenic hiking trails and beautiful campgrounds. Plan a trip or vacation using detailed downloadable maps and referencing our sights guide, check the weather of the area, get the park address and driving directions, and find national park hotels and lodging. Hawai’i Volcanoes National Park is located on the Island of Hawai’i, 96 miles from Kailua-Kona and 30 miles from Hilo. The nearest major airport is Honolulu International Airport and there are airports at Hilo and Kona on Hawai’i. Take Highway 11 Southwest 30 miles to the park. 1. Take Highway 11 Southeast for 96 miles to the park. 2. Take Highway 19 to Highway 11 through Waimea and Hilo for a 125 mile drive to the park. Hilo and Kona Airports are served by inter-island carriers. Some major airlines have direct flights to Kona from the continental U.S. Rental cars may be reserved at both airports. At various locations you can catch the public bus (Hele-on, phone 935-8241or web page: www.co.hawaii.hi.us go to: What’s New. select: Bus schedules ), commercial tour buses, taxis, motorcycles and bicycles are available. No rental vehicles or bicycles may be obtained in the park. Hawai’i Volcanoes National Park was established in 01 Aug 1916 as Hawai’i National Park, and on 22 Sep 1961, its name was changed to Hawai’i Volcanoes National Park. The Park displays the results of 70 million years of volcanism, migration, and evolution — processes that thrust a bare land from the sea and clothed it with complex and unique ecosystems and a distinct human culture. The park encompasses 230,000 acres and ranges from sea level to the summit of the earth’s most massive volcano, Mauna Loa at 13,677 feet. Kilauea, the world’s most active volcano, offers scientists insights on the birth of the Hawai’ian Islands and visitors views of dramatic volcanic landscapes. Over half of the park is designated wilderness and provides unusual hiking and camping opportunities. In recognition of its outstanding natural values, Hawai’i Volcanoes National Park has been honored as an International Biosphere Reserve and a World Heritage Site. 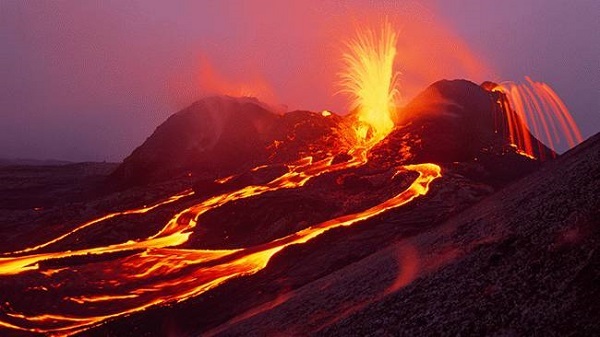 Volcanos are monuments to earth’s origin, evidence that its primordial forces are still at work. During a volcanic eruption, we are reminded that our planet is an ever changing environment whose basic processes are beyond human control. As much as we have altered the face of the earth to suite our needs, we can only stand in awe before the power of an eruption. Today Hawai’i Volcanoes National Park displays the results of 70 million years of volcanism, migration, and evolution – processes that thrust a bare land from the sea and clothed it with complex and unique ecosystems and a distinct human culture. Created to preserve the natural setting of Kilauea and Mauna Loa, the park is also a refuge for the island’s native plants and animals and a link to its human past. Park managers work to protect the resources and promote understanding and appreciation of the park by visitors. Research by scientists at the Hawai’ian Volcano Observatory has made Kilauea one of the best understood volcanoes in the world, shedding light on the birth of the Hawai’ian Islands and the beginning of planet Earth. The Kilauea Visitor Center, Jaggar Museum, Volcano House Hotel, and Volcano Art Center Gallery are wheelchair accessible. Pullouts along Crater Rim Drive and Chain of Craters Road afford panoramic views of the park. For information on accessible pathways, other facilities and programs, inquire at the visitor center. Bicycles are not permitted on park trails. Check with the rangers for exception. Hawai’i Volcanoes National Park has two drive-in campgrounds – Namakani Paio (located off of Highway 11), and Kulanaokuaiki (located off of Hilina Pali Road). These campgrounds are FREE – the only fee that applies is your entry fee to the park. Camping is available on a first-come basis. No reservations, No permits, and No check-in are necessary. Stays are limited to 7 days in a month and not to exceed 30 days per year. Volcano House Hotel, across from the Kilauea Visitor Center on the caldera rim, provides lodging (including rustic cabin rental), gift shops, restaurant, and snack bar. Also nearby Volcano Village has general stores, gas stations, restaurants and bed and breakfast lodging. The character of the park is best discovered on foot. There are over 150 miles of trails in the park. Hike the park trails to experience the park’s essence and to gain an understanding of the natural and cultural history of Kilauea and Mauna Loa volcanoes. Day hikes as well as backcountry trips of several days duration are available. If you only have a single day, explore Kilauea’s summit trails. Highly recommended is the Kilauea Iki Trail, a four mile, two hour hike, descending 400 feet through native rainforest into a crater, and across lava flows still steaming from the 1959 eruption. Fires are prohibited except in the pavilion fireplaces located at Namakani Paio, Kipuka Nene and Kipuka Puaula. Check with rangers about briquettes or camp stoves. Do not smoke while hiking. Park vehicles in designated pullouts; the exhaust system of a vehicle parked in a grassy area can start a fire. Collecting rocks, (including lava, sand, and minerals), cultural artifacts, or plants and animals is prohibited. Kalapana area and their guests. Pets must be under control at all times. Dogs are not allowed on trails, in the backcountry, or at Kipuka Nene campground. Nene and other ground nesting birds are vulnerable to harassment and predation. Motorized vehicles are restricted to paved roadways. Cultural Resources include archeological sites and artifacts. Do not climb on or alter any rock structures, such as walls, heiau (ancient temples) or petroglyphs (rock engravings). Hawaii Volcanoes National Park has distinct climate zones that vary according to elevation. Visitors should be prepared for a wide range of weather conditions. Weather at the summit of Kilauea (4,000 foot elevation) fluctuates daily and can be rainy and chilly any time of the year. The coastal plain at the end of Chain of Craters Road is often hot, dry and windy. Bring rain gear, light sweaters or jackets, sturdy shoes, hats, water bottles, sun glasses and high UV factor sunscreen. Call: 808-961-5582 for island weather forcasts.